Femoral neck fractures in below-knee amputees should be managed by total hip arthroplasty as a primary procedure before the onset of post-traumatic complications which are much more challenging to treat. Department of Orthopedics, Ibn Jazzar Kairouan Hospital, Les aghlabites Surgical Unit, Kairouan, Tunisia. Department of Orthopedics, Ibn Jazzar Kairouan Hospital, Les aghlabites Surgical Unit,3100, Kairouan, Tunisia. Introduction: Femoral neck fracture on amputated limb is an uncommon lesion and challenging to manage. Case Report: We report a case of a displaced neck fracture of the left femur in a 57-year-old female. 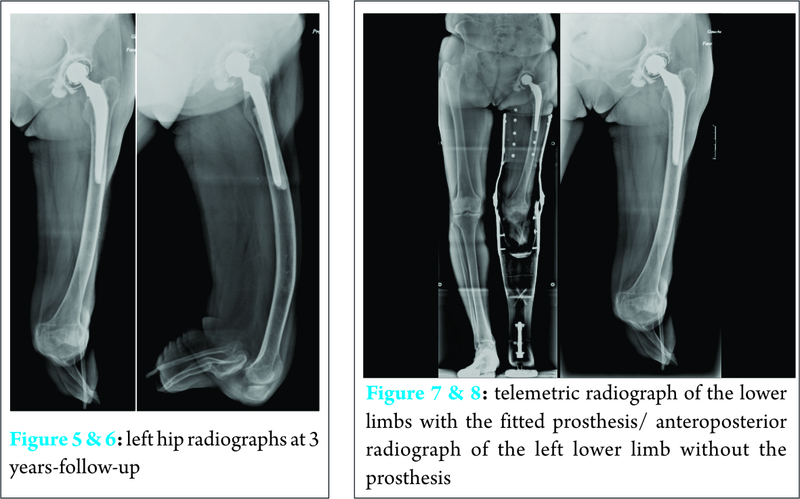 She underwent at the age of the three a below-knee amputation of the ipsilateral limb for post traumatic ischemia. The fracture was managed by a total hip arthroplasty (THA), as a primary procedure. In this article we describe our experience of this unusual entity. Conclusion: Total hip arthroplasty in patients with lower limb amputation is a challenging and uncommon intervention, especially when it’s a primary procedure. It may provide satisfactory outcome, and allows early rehabilitation. Keywords: amputations, total hip arthroplasty, femoral neck, hip fracture. Hip fractures are a common source of morbidity and mortality worldwide. Nevertheless, the discovery and development of hip arthroplasty has improved its prognosis, with a high survival rate, and satisfactory functional results [1, 2, 3]. Although total hip replacement has been well described in the literature especially for healthy individuals, we found few pieces of information about the technical characteristics and results of this procedure in patients with lower extremity amputation [1, 2, 3, 4 5; 6]. Lower limb amputees can have many musculoskeletal problems such as osteoporosis, severe osteoarthritis, and muscle deficiency. [1, 2, 3, 4, 5, 6, 7, 8, 9, 10]. Femoral neck fracture on amputated limb is an uncommon lesion and challenging to manage because of technical difficulties such as the patient setup, the surgical approach and the stump manipulation[2, 8, 11]. We report a rare case of femoral neck fracture in a patient with homolateral transtibial amputation, managed by a primary total hip arthroplasty. The functional outcome was good with a Harris Hips score at 87/100, and a Paustel-Merle-D’Aubigné at 16/18. The left hip radiographs did not reveal any signs of loosening or migration of the femoral and acetabular implants, neither signs of polyethylene wear (Fig. 5, 6 & 7). Some authors have established that amputee patients have a high risk of homolateral fracture because of the lever arm carried by the prosthesis, as well as the high rate of osteoporosis [2, 8, 10, 11]. This has been explained by the lack of mechanical stress on the amputated limb, while the unamputated one carries more loads . Analysis of precedent literature showed that most surgeons preconize non –operative or conservative treatment for hip fracture in amputees patients, especially for the young ones, such as reduction and fixation or hip arthrodesis [11, 12, 13, 14]. Nevertheless, the risk of non-union of the fracture in such patients is higher. This can be explained by the biomechanic changes in the site of fracture: in patients with lower limb amputation, there is lateral shifting of the center of gravity that lead to increase the shearing forces on the fracture . To our knowledge, there have been few publications reporting a THA in patients with below Knee amputation: Solomon and al , Salai.M and al . Solomon  described a total hip replacement for severe osteoarthritis for a dysvascular below-knee amputee. Salai  reported a small series of five patients with below knee-amputation who underwent total hip arthroplasty for a subcapital femoral fracture. In only two cases, the THA was a primary procedure. We believe that, up to date, this article is one of the rare case reports of a primary THA for a femoral neck fracture in a below-knee amputee, in the same side. Total hip arthroplasty after lower extremity amputation can be very challenging, with serious technical issues such as surgical preparation, hip dislocation and reduction, component positioning and rehabilitation. – the dislocation of the hip may require, in some cases, a trochanteric or a femoral neck osteotomy [4, 7]. – Bone stock loss can cause an early loosening of the implant [4; 5; 7], especially in case of cementless arthroplasty. – Muscular deficiency in the amputated limb increases the risk of hip dislocation . In our case, we chose a total hip replacement because of the relative young age of the patient (fifty-seven years old), the high level of activity and autonomy using her usual prosthesis, as well as the high life expectancy (no medical history of cardio-vascular or respiratory diseases). She underwent a total hip arthroplasty through a transgulteal approach, according to Hardinge. This approach was chosen because it offers a better exposure of the implants . Several techniques have been perfomed by orthopaedic surgeons worldwide to prevent arthroplasty dislocation in patients with neuro-muscular diseases, such as constrained implants. . 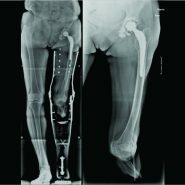 The arthroplasty included a stainless steel, monoblock, cemented, femoral implant and a cemented, polyethylene retentive cup. 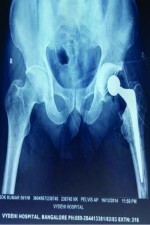 The muscular deficiency due to amputation, which increases the risk of instability, has encouraged us to choose a constrained acetabular implant. We preferred a cemented arthroplasty rather than the cementless one, because of the lower risk of loosening on an osteoporotic field. -the normal anatomy of the hip enabled us to use the anatomic landmarks, such as the lesser trochanter, the femoral calcar, the linea aspera [4, 7] and the native acetabulum, to avoid malposition of the implants. Therefore, we used the physiological orientations with 10° of anteversion in the femoral component and 45° of abduction in the acetabular one. The authors present this case because THA has rarely been reported as a primary treatment for acute femoral neck fracture in BKA while internal fixation is still relevant for this type of entity . Most orthopedists resort to technical tips using material or specific constructs unlike our report in which we chose to use the normal anatomy of the patient’s hip as a guide in the implants positioning. – Acute femoral neck fracture in BKA should be managed by THA as a primary treatment, before the onset of post-traumatic osteoarthritis of the hip and avascular necrosis of the femoral head. At these stages, the procedure would be much more intricate since a hip dislocation is required. – Total hip arthroplasty provides a better rehabilitation with an early full-weight bearing and return to ambulation, unlike internal fixation, in the management of femoral neck fractures, even the non-displaced ones. – The high risk of sustaining a fracture in osteoporotic residual stump should be included in the health education of amputee patient.